Free phone calls -- three words AT&T does not like to hear. But iPhone users can now access the popular Skype network via a new application available today, allowing them to bypass ol' Ma Bell, the iPhone's primary service provider. The VOIP software lets users talk and chat to other Skypers for free and they can also make substantially discounted local and international calls to any landline by purchasing Skype credit. No doubt an AT&T exec is groaning somewhere. While you can chat over any Edge or 3G connection, calls work only while connected to Wi-Fi.The app resembles the native iPhone phone program an includes features like mute, speaker phone, and hold. 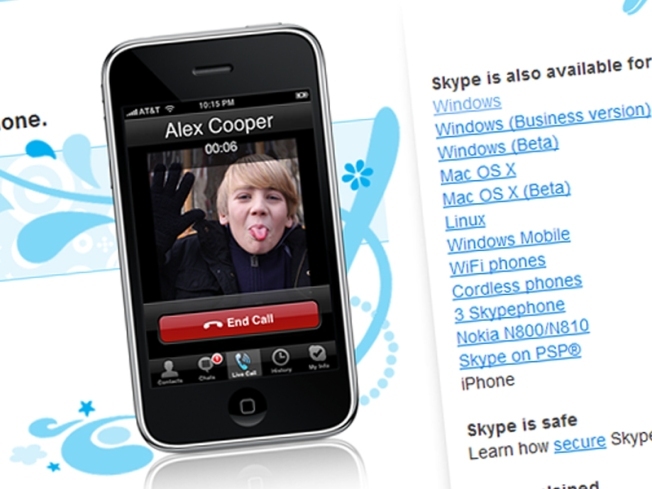 You can access all your contacts including your Skype bookmarks from a simple screen. The application is available for free through the Apple App store.